Health insurance plans are based on a rationed primary care model. Over the past decade, ever-higherdeductibles, increases in the percentage of costs an employee pays for services subject to cost-sharing arrangements, and the proliferation of high-deductible health plans (HDHPs), have discouraged employees from over-consuming healthcare, for financial reasons. In its 2017 annual survey, the Kaiser Family Foundation found that enrollment in employer-sponsored HDHPs increased to 28% in 2017 from 19% in 2012. The Foundation also determined that in 2017 the average deductible exceeded $1,500 for the 81% of workers covered by employer-sponsored health insurance plans with a general annual deductible. The result of this growth in the percentage of employees covered by HDHPs and other cost-sharing arrangements is that a simple doctor’s visit may cost an insured employee or family member $150 or more Additionally, lab work, which is rarely covered before deductibles are met, often leads to far higher total costs for a doctor visit and treatment. At the same time, 44% of Americans report they would have difficulty finding $400 to address an emergency. The Atlantic captured the severity of the U.S. healthcare-cost crisis in an article titled, Even the Insured Often Can't Afford Their Medical Bills. Studies by Mercer and researchers affiliated with the National Bureau of Economic Research (NBER) have concluded that the adoption of HDHPs leads to short-term employer healthcare cost savings of approximately 13%, but the long-term consequences of HDHPs may prove less benign. Unsurprisingly, high-cost medical visits create an incentive for sick employees to postpone doctor visits. Indeed, a recent survey conducted by West Health Institute and NORC at the University of Chicago found that last year the cost of a primary care visit deterred an alarming 44%, of Americans from seeing a doctor when they were sick or injured. As sick employees with health insurance delay treatment due to costs, their illnesses often grow more severe, ultimately becoming far more expensive to treat. Now, Gartner reports that many companies appear to be rethinking their commitment to HDHPs, which are not proving to be the anticipated “silver bullet” solution to rising healthcare costs. Moreover, the negative workplace effect of delayed rationed primary care extends beyond healthcare costs. As employee frustration increases, so does absenteeism; meanwhile, morale and productivity decline. Cross-national analysis by the Commonwealth Fund highlights the value of widespread, easy access to primary care. 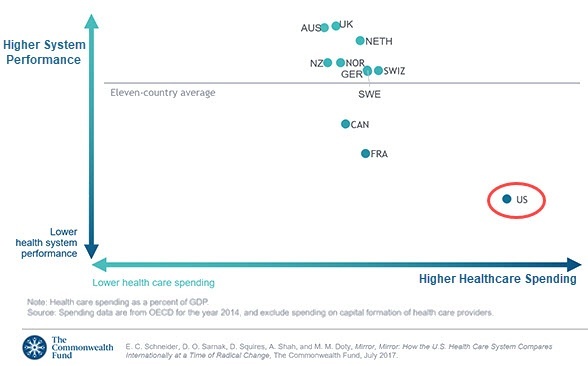 In a study of eleven countries in the Organisation for Economic Co-operation and Development, the Fund found that the U.S. spent the highest amount per capita but had the worst health outcomes. In analyzing this phenomenon, the Fund cited a lack of timely, affordable access to primary care as a central cause of poor health outcomes in the U.S.
Over the next several years, the existing shortage of U.S. primary care doctors is expected to grow more severe, and the problems of easy access to affordable care will become even more dire. Both employers and employees may benefit from taking a less black-and-white perspective on primary care spending. Specifically, employers might consider whether they can reduce their total healthcare costs by encouraging employees to seek primary healthcare at the right time, in the appropriate venue. Onsite Clinics: An increasing number of large employers offer onsite clinics on their corporate campuses. These clinics provide a variety of services, often including no-cost immediate primary care visits for employees and their covered family members. One study found these clinics provide the greatest value for employers in treating employee populations with low primary care usage rates. High Utilization Telemedicine: At First Stop Health, our 24/7/365 telemedicine service typically offers unlimited doctor visits with no out-of-pocket cost to employees and dependent family members. An estimated 40% of all patients who now visit healthcare facilities suffer from common conditions whose diagnosis and treatment do not require an onsite physical exam. By diverting these patients to doctor visits via telemedicine from more expensive physical facilities, such as the E.R. or urgent care centers, First Stop Health achieves healthcare cost savings that significantly exceed the expense of providing the service to employees. For both onsite clinics and telemedicine, extensive employee education on the value of these easy-access services leads to high utilization by employees, meaningful employer and employee cost savings and ROI, better employee health, improved productivity, and reduced absenteeism.